The history of the Supermarine Spitfire is well known, given its fame during the Battle of Britain. 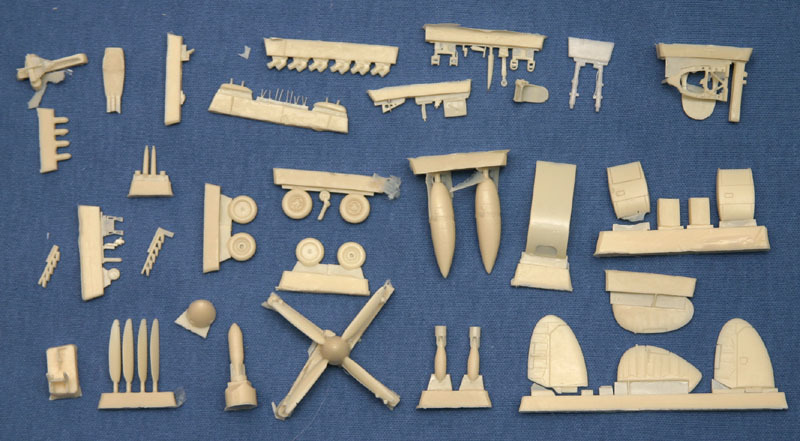 Given this, it is no surprise that quite a few model kits of the Spitfire have been produced over the years, with just about every variant kitted in one form or another. 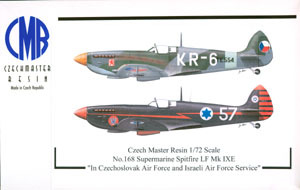 Where the mainstream companies end, Czech Master Resin begins, and their Spitfire/Seafire lineup is truly impressive. 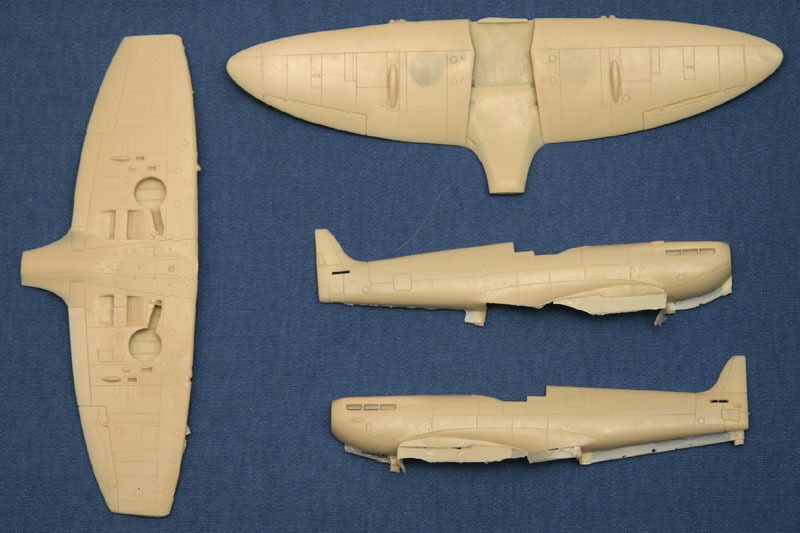 Starting at the beginning, CMR has produced kits of the prototype and early Mk.I Spitfires, and over the years have produced kits of what could be considered the ultimate end of the Spitfire line, the Spiteful and Seafang. In between are quite a few others, including this release, the LF Mk. IXE Spitfire. Cast in tan resin, this kit is broken down in a very similar manner to the other CMR resin Spitfires, but with something new: photoetch. More on that later, though. The kit features recessed panel lines throughout and ample detail both inside and out. As it is a resin kit, it will require some different assembly methods, but much effort has been taken to make this an easy to assemble kit. 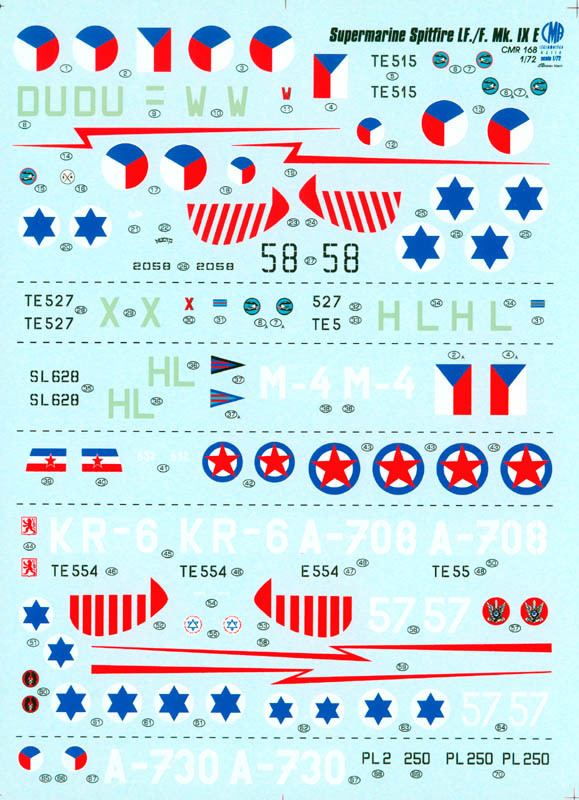 The decal sheet is large and provides markings for over a dozen variations. Starting with the cockpit, it is here that the new photoetch fret shows up. You get sidewalls, bulkheads, the instrument panel, and lots of other nice details on the Eduard photoetch fret. This, coupled with the already nice resin pieces, will make this out of the box interior a showstopper. With the option to have the side door open, much of this can be seen, so spending a little extra time in painting here will pay off in the long run. Once the interior is done, the fuselage halves are buttoned up and then it is decision time. Rather than provide separate wingtips as many kits do, CMR includes two complete wings, one with the clipped tips and one with the regular tips. Separate cannon pieces allow for all the different armament variations, and two styles of rudders further increase the options, as do the two styles of exhausts. Finally, there are several underside options, including the conformal fuel tank, bombs, and what look like Bf 109-type drop tanks for the wings. The landing gear is nicely detailed and supplemented by photoetch gear doors. The canopy is vacuformed, and the kit includes a set of masks. Moving on to the decals, this kit is labeled “In Czechoslovak Air Force and Israeli Air Force Service,” and the decals reflect that. There are more Czech than Israeli, though, with a solo Yugoslav Spitfire thrown in for good measure. Most are finished in a standard RAF camouflage of Dark Green and Ocean Gray over Medium Sea Gray, with a couple in overall aluminum and a black Israeli example. A lot of research went into these schemes, and the decals themselves are nicely printed. This is a nice addition to the 1/72 Spitfire lineup, and although the resin might scare some off, it looks like a fairly easy build. The colorful marking options make it difficult to decide which one to do, so you might find yourself picking up a few of these kits. If you like Spitfires, definitely check out the CMR lineup.